The Gila River Valley offers abundant vistas, wildlife, peace and tranquility. 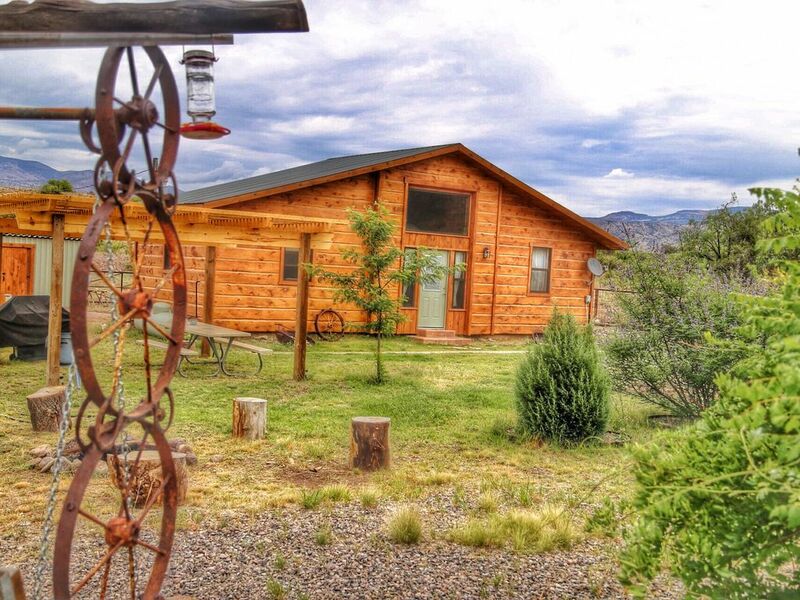 The Gatehouse at Bearpaw Ranch is perfect for a small family or couple. It is a handmade log cabin with high ceilings and lots of light! There is a cute sleeping loft with a trundle bed and it has a fenced yard It is a short walk down to one of our 4 ponds, with the Gila River just beyond that. Ideal for hiking, hunting and fishing, Bearpaw Ranch is also close to Bill Evans fishing lake and a short drive up to the Gila wilderness. Our property lies on the Gila River and you will have complete access. We have a large barn and fenced field if you are bringing your horses. Ideal for hunting in the fall and winter. The wilderness begins a few miles up the road. Perfect for hiking and climbing, and bird-watching. There is a wild-bird preserve just a few miles south of us. Of course the bosque here on the property affords great access to spotting numerous bird species. Silver City is 30 miles to the south and has many art galleries and restaurants. Bearpaw Ranch is a great place to stay during the Blues Festival, the World Class bicycle races, or the Wild West Rodeo. The hotels in Silver City fill up, but you can take the short drive out to the Gila and rest in the quiet and peace, refueling for another fun time enjoying Silver City's great events. In the mountains north of Silver City you can visit the old western town of Pinos Altos, and continue up to the Gila Cliff Dwellings. A visit to the copper mines is also a must, with a stop at Lake Roberts on the way! To the northwest of us is historic Mogollon with its art gallery, antique shop, and museum. Near Mogollon is the little village of Glenwood, with the state fish hatchery and the famous Catwalk. The Catwalk is a favorite hiking spot with a lovely picnic area. The night sky offers a magnificent and unequaled view of millions of stars, planets and the Milky Way in all of it's glory. New Mexico values our dark night skies and a quick google map search will reveal that Gila is by far one of the darkest places in our country. If you have never known (or knew but its been a long time) what it is to be able to stroll in the starlight, you really must come visit. There is plenty to do in the area, but many folks find that they are content to walk around the property, visit our horses, watch our ducks swim around in the pond, or just sit and listen to the quiet. This is a perfect retreat if you just want to get away...far away from the rat race. This is real out-west country living. Hi there! I am Rose and I have lived here for 36 years. This is a small ranch and we have horses, mules, and a few head of Longhorn cattle. We raise heritage breeds poultry including chickens, ducks, turkeys, and peafowl. We have a large garden and fields in which we grow vegetables and feed for the animals. We believe in healthy eating and grow all of our produce using organic methods. Our livestock all live cage-free and free-range. No coops or corrals for our critters! We gladly share farm fresh eggs with our guests, and you might find that they are the best eggs you ever ate! As an antique nut, I have collected too many articles to fit in my old house. Bottles, mining tools, old dishes, stoves, tools, tins, crocks....etc So, I had a building built to look like an old west store and you are welcome to go in and look at my collection. I call it the 'old store'...but it is really just a place to house my dust collectors. It's fun! I have raised my children in this small community, but now they are all grown, and I have room to share! The Cliff/Gila community is an eclectic mix of folks who love the Gila. There is one little gas station, a library, a Senior Citizen Center, a small farmers market/co-op, a school, and a few churches. The Community Center has tennis courts and a basketball court along with swings for the children. This is a wonderful community to live in, and I am happy to share it with my guests. Our property straddles the Gila River with complete access to the river. We also have 4 small ponds and our guests are free to wander about the property and enjoy the river and ponds along with the bosque they create in a very private setting. Many dog-owners love staying here because it is a time when their city dogs can really feel what it is to be free and unleashed! We are on the edge of the Turkey Creek entry into the Gila Wilderness and many hikers love staying here because of the access to many great hiking and birding spots. We are also right between Glenwood and Silver City. A handy central location if you are hiking AND enjoying the museums, galleries and eateries of Silver City. I think the one important thing that my guests have told me they love the most is the peace and quiet. We live and work here and sometimes we are cultivating, cutting wood, making repairs, and in general just working...doing all the things that are demanded on a small farm and ranch. But, people still feel a sense of peace. We go about our business and our guests must just feel like they are part of the ranch. It is an easy feeling here that is unique and most everyone comments on it. There are no outside lights so at night it is really dark and you can see the moon and the stars in all their glory. There is abundant wildlife. You are likely to see fox, raccoons, javalina, coyotes, rabbits and lizards, and many species of birds. All of this wildlife and quiet, yet we are just 2 or 3 minutes off of the road. You can't see or hear the road from the cabin, but it is easy to get into and out of our little ranch and the paved highway leads right to the little village of Gila just 3 miles down the road. It is a slower pace. It is less rules, more freedom. It is the desert southwest in the Land of Enchantment. I find that it is hard to explain. But, when you come...you will feel it. Bearpaw Ranch is very rural. Quiet and serene. If it is stress relief you are seeking, here is the place to be. On the edge of the Gila Wilderness there are mountain views all around. Coffee, coffee filters, sugar and creamer, salt and pepper. The cabin is well equipped with pots and pans, mixing bowls, and dinnerware. The cabin has a cute little kitchen with a full size refrigerator, a small gas stovetop and oven, toaster oven, coffee pot, microwave and a good assortment of pots, pans, bowls and tableware. The cabin has satellite TV including all of the premier channels...HBO etc. Wonderful vacation. Our hostess Rose couldn’t have been any nicer & helpful with activities in the area. We stayed at the pond cabin which has a rustic western feel, well supplied with the nessesities, comfortable beds/bedding & decorated eclectically. You can freely walk the grounds, museum, visit the animals, Gila River & just explore. Sunrise, sunset, the stars are amazing & even caught a full moon. We were the only cabin without a tv & didn’t miss it. We are already looking forward to returning. The property was beautiful and Rose and her daughter were very helpful with local spots that would be great to eat at as well as hike. The cabins on the ranch are all different but also very well provided with well stocked kitchens and Dish TV and wifi. There is no cell service but the T-Mobile wifi worked perfectly. It was good that the cabins had A/C as August was warm. We with hiked with our dog in the Gila National Forest as well as the Gila Wilderness. He loved it especially the rabbits. Silver City has a wide selection of restaurants and Pinos Altos is an interesting place to explore including the old Opera and the Saloon. Although Rose was not there due to surgery her daughters and staff ensured we were taken care of and answered any questions. All in all a great place to get away and enjoy the natural setting of New Mexico. If you are averse to the experience of being in a heavenly place, surrounded by serenity, the soothing sounds of a burbling brook and the distant lowing of happily-grazing cattle, under the care of the kindest, warmest, most enthusiastic of hosts, then please, don't waste your time considering Bear Paw Ranch and their inimitable rental cabins. BUT! If you find that you are amenable to all things heavenly, and if you happen to appreciate the creativity of an inspired carpenter who hand-milled timber and custom-designed every facet of a place, then you have come to the right listing and should waste NO time booking your getaway. I originally contacted Rose, the amazingly warm proprietor of Bear Paw Ranch, in regards to the Gate House Cabin, one of several rental cabins on her ranch. After I told her a bit about my husband, for whom this getaway was a birthday surprise, Rose pointed us towards the Pond Cabin, being that Rose's husband built this place from scratch and filled it with all sorts of rustic, artistic, and old-timey details. I was touched that Rose took a personal enough interest right off the bat to make sure my husband's birthday present was as well-suited to him as possible. And sure enough, my husband loved the Pond Cabin and its location, nestled at the end of a dirt road near a little brook and a pond. Rose greeted us warmly upon our arrival to the ranch, and gave us invaluable tips on off-the-beaten-path sights to see in the general area. We lounged on the Pond Cabin's second-story balcony during the lovely afternoon monsoon thundershowers. My husband enjoyed fishing in the pond each evening. We were fascinated by the craftsmanship of the cabin itself, as well as the wonderfully eclectic collection of antique items displayed throughout the ranch. The property itself just had a peace and a grace to it that is so rare in this world, and as other reviewers have mentioned, the stargazing was unparalleled. I have never seen the Milky Way look so "milky" and well-defined! Rose has over 100 acres that guests are free to roam, and the Gila Wilderness abuts her ranch. I cannot recommend this place highly enough, as well as the staggeringly beautiful surrounding countryside. And the price is so incredibly reasonable for such a heavenly place and such a unique experience. You will thank yourself for booking your next getaway at Bear Paw Ranch! Thank you for an enjoyable stay at your Gatehouse. It met all expectations. The property is located on a private ranch with lots of space to wonder. You can walk down to the Gila river and hang out, spend the morning by the ponds on property, or check out the nearby Cat Walk. The inside is clean and cozy with one queen bed in the master bedroom and one single upstairs in the loft for one person. The inside is very small but we spent most of our time sitting outside enjoying the beautiful ranch. We took our dogs and the property is big enough that we were able to leave the front gate open without worrying that they would wonder to the other houses. Overall a great getaway. We will be back! We are delighted that you enjoyed the ranch with your family and your dogs! Getting a great review like yours is always nice, but I’m so sorry that you were unaware that there were two beds upstairs. I just feel terrible that one of your kids didn’t have a bed! That bed in the loft is a trundle bed with the second bed just slid under thhe top one. I’m going to make a sign for up in the loft so that nobody else has that problem. Again, thank you for the great review and I’m so glad you enjoyed your visit. I sincerely hope you’ll come back sometime soon!!! Hosting good folks like you is what makes it all such a joy! We are located just a few miles from the Gila Wilderness. Our property straddles the Gila River and the bosque is delightful for bird-watching. You will enjoy walking about the property and watching the wildlife on and around our 4 ponds. You will have complete access to the river and you can enjoy the hiking, rafting and bird-watching that the river and its habitat provide. In addition, ours is a premier location for star-gazing. New Mexico is the only state in the union with night light legislation and Gila is one of the darkest places in the country. The property has a large flat hill that is a premium spot for night sky observation and we have hosted several amateur astronomers over the years. Bearpaw Ranch also has barns and fenced fields for horses and is an excellent place to stay with your horses. Bearpaw Ranch is perfectly situated for exploring the area. A short drive up Turkey Creek Road and you are in unspoiled wilderness. 30 miles north is Glenwood and Mogollon, both great destinations for exploring small town and ghost towns of the desert southwest. 30 miles south and east is the popular Silver City with her museums, galleries, and excellent eateries. Beyond Silver City is the Gila Cliff Dwellings (a MUST SEE), along with the old mining town Pinos Altos and Lake Roberts. Most of the nearby day trips are an easy 30 minutes from Bearpaw Ranch. Then you come home to your cabin to peace and quiet where you can stroll around the property and unwind. Or just sit on the porch and listen to the country sounds.